Now the size of a city, Castle Volkihar Redux is the ultimate vampire kingdom for the true overlord of Skyrim. All blocked portals now go to new places. New towers, quests, buffs, armors, weapons, followers, amenities, crafting and more. Dawnguard DLC required. Prior to Harkon's rule his older brother Brunar was the head of the Volkihar family. After becoming vampires a power struggle began. Harkon created a powerful vampire army, stormed the castle and magically sealed Brunar and his small band of loyal coven members away in the family tombs. If you are able to acquire Auriels Bow you must find the coven and set them free.Thus begins your own journey not only to restore the castle beyond it's former glory but to reign as the supreme overlord of Skyrim. You can now build your own army of Draugrs, Gargoyles and Vampires. 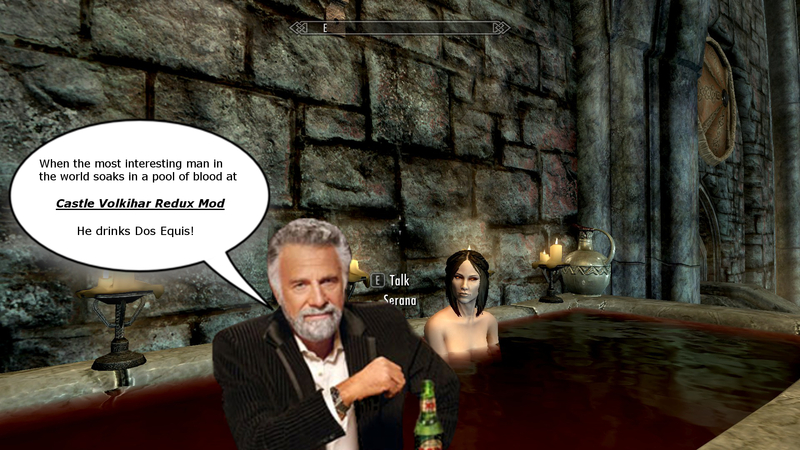 *Did you finish Dawnguard and wonder why Castle Volkihar didnt upgrade? *Did you think the blocked portals would open up into a real homestead? *Then look no further, this mod does exactly that and more, read on! Once the castle is yours Draugr guards and a new vampire coven members loyal to you will begin to patrol the castle inside and out. Some new followers are gained through quests. Additional Draugr sentries can also be added through a quest. Castle Volkihar Redux not only offers access to every kind of crafting station in the game, you will be provided with a special 25% bonus when using them! There are new primary crafting stations such as a Forge, Alchemy Tables and Enchanting stations. A Wood Chopping Block can be found on the upper tier of the shipyard and Cooking Pots. 4 unique Blood Cauldron/Buckets to brew blood potions are spread throughout the castle. You will find mannequins, weapon/racks, chests, display cases, and much more throughout the Castle. You will want to visit the North Tower Vault which is specifically designed for the safe storage of your items & display's for your Dragon Priest Masks and Dragon Claws. A bust of change your face can also be found in the North Tower's bathing area. One will also unlock the Daedric South Tower through a quest (The Forgotten Tower). It provides uniquel display's for most all Daedric items found within Skyrim including Dragon Scrolls. Knowledge of teleportation magic has been added from the soul cairn. This teleportation wing is known as 'Teleport Tower West'. It is located in Valerica's Tower. It can be found by using any of the teleporter pads found in each wing of the castle. It includes two teleportation networks, one for the castle internally and one to six major cities throughout Tamriel. A spell tome that teaches the spell 'return to castle Volkihar' can be found in this very wing. *The Castle's Shipyard and it's boats have been restored. You can use them to travel to the shores of Tamriel. *There is a portal to the Forgotten Vale in the castle tombs found during the quest 'Fortify Volkihar'. *Two fast travel markers are also added. One in the Shipyard and one on the East Tower balcony. A 5,000 gold monthly income has been added when the quest 'Port of Call' is completed. Visit Captain Wheeler each month to collect it. Daedric South Tower (daedric artifact displays), Valerica's Tower (Formerly the ruins), North Tower (vault), East Tower (alchemy, armory, training and guest rooms), *Teleport Tower West. *Several dungeons have been added. A Gargoyle Lair, secret cave and a few vampire lairs which must be cleared out to inhabit. 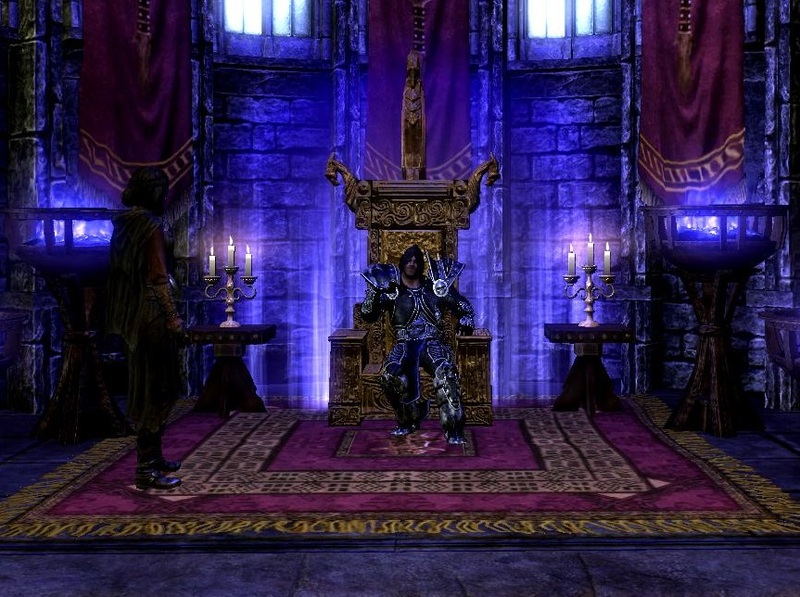 Two Molag Bal shrines are added to the castle. But let it be known that the blessing from Molag Bal trumps all those other lesser daedric blessings combined. When Molag Bal bestows his chosen with a blessing, he wants them stronger than any foe in the known planes of existence. These shrines are found in Harkon's Cathedral off of the Keep & inside the Temple of Molag Bal in Valerica's Tower. *The Undercroft will be upgraded into a flea market with added merchants. The castle now hosts every type of vendor found in the game. You will find a Blacksmith at the Shipyard, an alchemist trainer in the East Tower Alchemy Bazaar (foyer) and many more inside the Undercroft. Robes of the minions of Molag Bal. These highly enchanted robes help his minions carry out his desires throughout the plane of Tamriel and beyond. The robes (crafted in Coldharbour the realm of Molag Bal) are 2nd to none for mages, warriors and thieves. The robes are also craftable at the shipyard smith under misc should you want to create un-enchanted versions or to cloth new initiates you bring into the fold. A custom vampiric horse can be found in a small stable near the shipyard docks, two ethereal swords are found during the quest 'It's Good To Be King'. *Custom Family Home - A Hearthfires adoption and wife moving mod! Yes you can now move your kids into Castle Volkihar with this mod! All guest rooms (8) are child compatible as well as the two coffins in the main sleeping area. I guess we'd only need 6 child beds for this mod to have it all... if it doesn't have 6 beds already. is this compatible with multiple adoptions? If not, may I suggest it? And do I get a bard? A Bard should be in my thrown room. @FrySkillet, please watch the following youtube video. It explains how to make sure a mod installs entirely. I am assuming you are using the older Skyrim and not the special edition. @SaiyanSwagr, the minions are non killable unless you used a mod to make them killable. I left a spot open on the end on purpose, there was a quest for a specific follower who ... becomes a molag bal worshipper. But I had to cut it out before releasing it because it was bugged. I had many struggles getting my quests to work right. There would be many more had I of had more time after finally figuring that part out. @TiTan0s, thanks for dropping in and breaking your silence! It's always nice to hear good things. It is appreciated. Please do make a youtube video, that would be awesome. I believe one of the minions was killed by gargoyles and now when I sit in the main thrown room the minions bowing are asymmetrical. Is there any way to get the missing person back?